The rise of social media has spawned the development of numerous new social platforms that offer marketers fresh and innovative ways to leverage the power of social media. One of the newest platforms that’s quickly gained a huge following is Pinterest. This unique photo-sharing site has opened the doors to some highly creative and effective examples of brand marketing, with one of the most compelling and cost-effective cases presented by Honda. MarketingMag.com took a look under the hood of the automaker’s savvy social media marketing strategy to see how their use of Pinterest delivered high exposure and engagement for a very low cost. As the fastest-growing social media platform, Pinterest soared to mainstream popularity in 2012. Many believe its appeal lies in its image-driven format and easily sharable nature. Pinterest pinboards are categorized by image topic and users can simply search or share the pinboards that pique their interests. While individuals were the first to discover the beauty and ease of Pinterest, brands have quickly followed their lead in order to reach this huge audience and leverage the power of Pinterest for their own promotional needs. 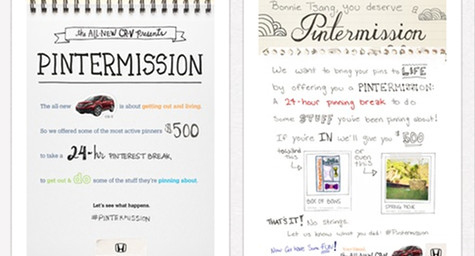 Honda was one of the first automakers to develop a presence on Pinterest. The automaker realized that many people were spending so much time on the social media site that they were developing “pinning habits.” This habitual pinning quickly convinced the brand to initiate its first Pinterest marketing campaign. Another catalyst for the campaign was that the Pinterest audience was virtually identical to the target market for their new CR-V. The car was targeted to young people about to reach major milestones like getting married and having children, who are now planning their big adventures online. To devise this social media marketing campaign, Honda began by identifying their users who had a high number of followers and then connecting with them. Next, they challenged these users to take a 24-hour break from Pinterest. They referred to this break as a #Pintermission. In return, Honda would give each user $500 to spend on making one of their pinned images a reality. Once the participants were chosen, Honda set up individual pinboards within its profile and posted personalized images. The participants were given permission to add image content to these pinboards so they could post the photos taken during their Pintermissions. To maximize their exposure, Honda encouraged the participants to create their own Pintermission-focused pinboards and make Honda a collaborator. The automaker also developed promotional posters that could be easily shared on Pinterest. Their Pinterest marketing campaign proved incredibly successful by generating over 16 million total media impressions. More than 4.6 million individuals were exposed to the #Pintermission boards and the effort amassed more than 5000 re-pins and nearly 2000 “likes.” In addition, the buzz extended far beyond Pinterest, as mentions of both the campaign and the brand steadily appeared on Twitter and Facebook. Most importantly, they received these stellar results and made a big impact for very little cost. Honda’s success with Pinterest will hopefully inspire other brands to come up with their own creative social media campaigns that leverage the platform’s marketing value. The Pinterest audience holds an extremely high appeal for many brands and the platform’s promotional potential is only limited by a marketer’s imagination. To leverage the power of social media, incorporate Pinterest into your social media marketing efforts. Contact MDG Advertising. Learn more about Pinterest by watching MDG’s video: A Marketer’s Guide to Pinterest. MDG Advertising, a full-service advertising agency with offices in Boca Raton and New York, NY, is one of Florida’s top creative ad agencies. Our 360° approach uses just the right mix of traditional and digital marketing to reach your advertising goals. While some industries may fare better in print and others online, we strive to create a balanced approach where traditional, digital, and social media marketing efforts support each other and your message is tailored to the medium. To stay on top of the latest trends in social media marketing and advertising, contact MDG Advertising.